KALININGRAD, Russia (AP) For Croatia’s golden generation, the great expectations held by key players outshine even those of the team’s fanatical fans at the World Cup. Since finishing third in its first World Cup as an independent nation, at France in 1998, Croatia hasn’t advanced from the group stage in the three World Cups for which it qualified. ”We have players playing at big clubs. They don’t just play. They are the driving forces of those clubs,” he said. Croatia faces a Nigeria squad that is the youngest at the World Cup, but has its fair share of quality, especially a group of talented forwards. Croatia coach Zlatko Dalic singled out Leicester’s Kelechi Iheanacho, Alex Iwobi of Arsenal, Chelsea midfielder Victor Moses and Odion Ighalo, who now plays for Changchun Yatai in China. 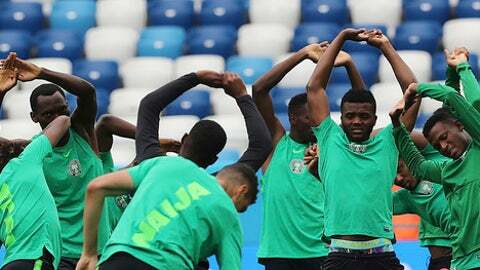 Nigeria was the first African nation to qualify for Russia, but the nation has often underachieved at World Cups. It has won only one of its last 12 matches on football’s greatest stage. And he insisted the case wouldn’t affect him in Russia.